Drive Luvuvhu Loop via Pafuri Picnic Spot. 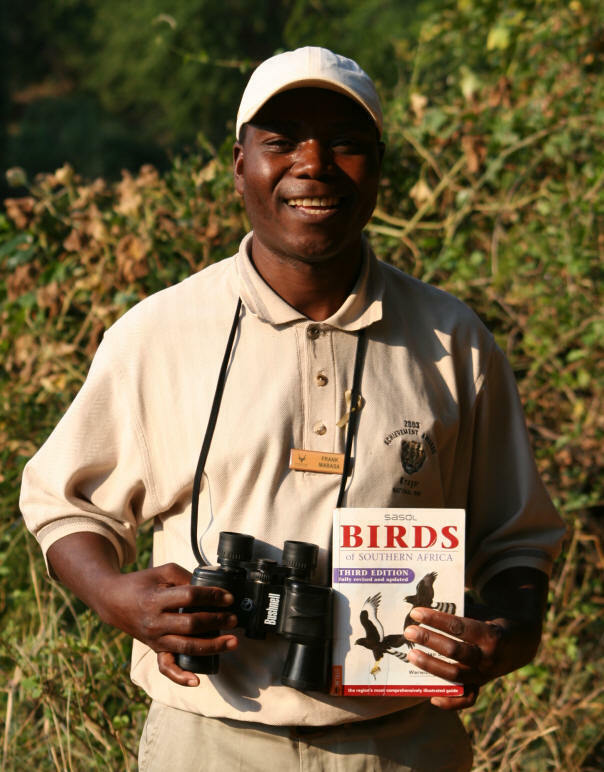 Meet Frank Mabasa, Master Bird Watcher at Picnic Spot. 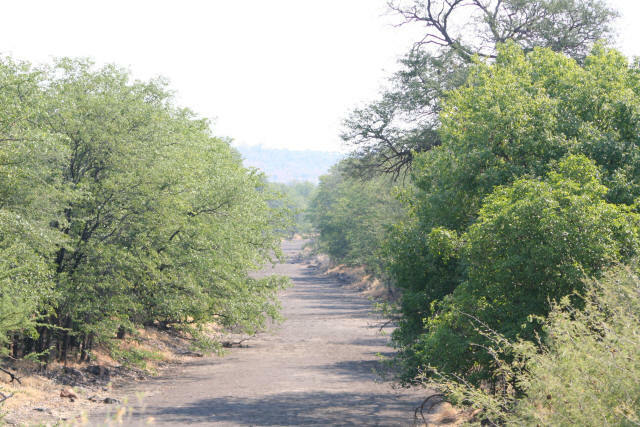 Turn off the main H1-9 road heading to Pafuri Gate at waypoint 39 and you immediately are surrounded by thorn trees and there is that inviting twisting reddish sand road ahead ... I did the route in a clockwise direction since I wanted the light behind me on the northern leg of the loop road to help with my photography ambitions. Prior to the turn off I was intrigued by a 1 km stretch (way point 37) of almost perfectly straight dry river bed looking west from the road. It would be a good place to perhaps place a webcam and record whatever crosses this river bed. The stretch was unusual in so much that few rivers I have seen in the KNP are so straight. Can you imagine the force of water rushing down this straight stretch in flood conditions? The name of the river on the map below is Ximuwana but I cannot find a reference to this name. A lot of names starting with "Xim ..." seem to have been changed to Tsonga words starting with "Shim...". The word Shimuwini which is very common in the Park means "at the baobab tree". 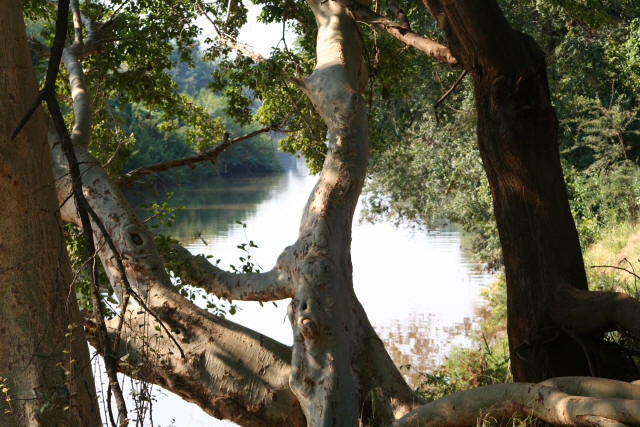 It would make sense that the river has this name being so close to baobabs and even Baobab Hill. 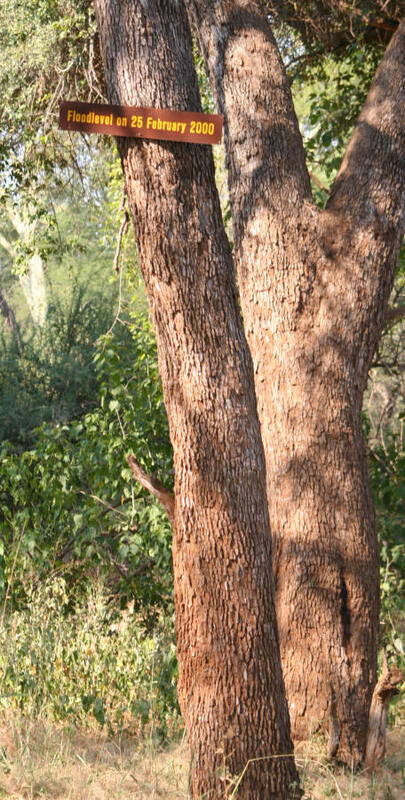 The photo here shows clearly the Mopane in tree form (left bank). We have already discussed the waypoint 038 which marked the high Luvuvhu river flood point during February 25th 2000. Waypoint 040 marks the Pafuri Picnic Spot area where you can get out, barbecue and walk around close to the River Luvuvhu. I met Frank Mabasa here. Frank is in charge of the Picnic spot and lives on the site. He is also an avid birder and has recorded 317 bird species in this single area. His list is posted on a tree in the area and he has on hand a bird spotting book. He is very happy to provide knowledgeable advice. His best sightings he told me have been Bohm's Spinetail and Pel's Fishing-Owl. On the banks of the river there is a viewing bench donated by the Zietsman family in commemoration of her death. Heather Zietsman was apparently a regular visitor to this place to enjoy bird watching. Sadly she died of malaria I believe. This is just an indication once more that for all its beauty the Kruger National park is a wild and remote sub tropical area and that it is important to take precautions when you visit the Park. Waypoint 041 ... here you will see a tree and on it is marked the Luvuvhu river flood level discussed before. There is also a permanent exhibition describing in detail the historical Thulamela site discovered in 1981. This is the image of the high point of the 2000 flood ... the level is about 11 or 12 feet above the ground. You would have been drowned had you been standing here on February 25th of that year. Very close to this spot was a relatively open area with long dry grass. It had been used as a sleeping area quite recently by the appearance of the trampled grass. As I watched for a while it was so easy to imagine a lion effectively stalking in this area. 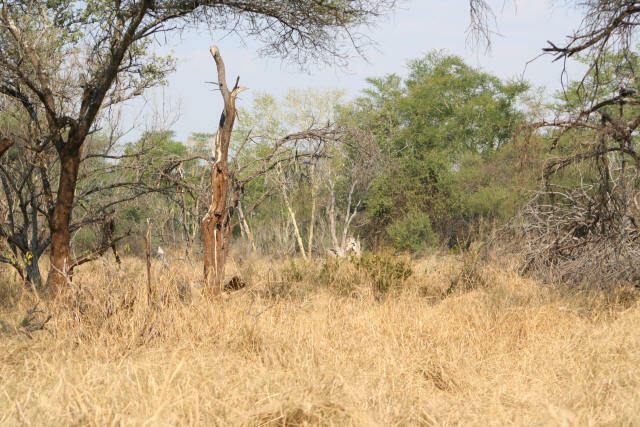 A lion would be so easily hidden and camouflaged by the golden colour of the dry grass. There are many lion in the area based upon ranger sightings. I saw a number of Nyala, Impala and a large group of Vervet Monkeys here. Click and take a look at this image ... can you see a lion? No ... I couldn't either but can you imagine the possibility of one lurking here; and how would you like to have to sleep here in the pitch darkness knowing lions have excellent night vision? Waypoint 043 ... if I wanted to stand a good chance of seeing a crocodile kill I think this would be a perfect spot. 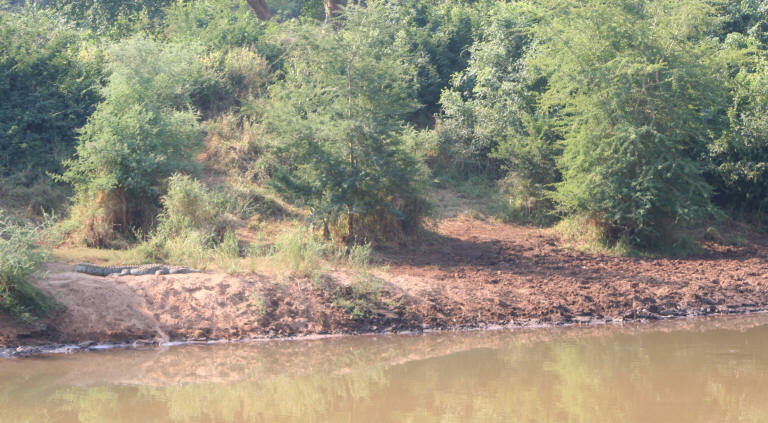 The far bank of the Luvuvhu was an ideal drinking spot as evidenced by the numerous animal trails down to the river's edge. And there were many many crocodiles confirming this spot was certainly popular amongst them and there were also very large crocs. The large crocodile shown at the bottom of the trail is just basking ... but later it will lie in wait close by no doubt? Frank Mabasa (above) told me had seen a crocodile take a warthog a few days earlier at the Picnic spot. 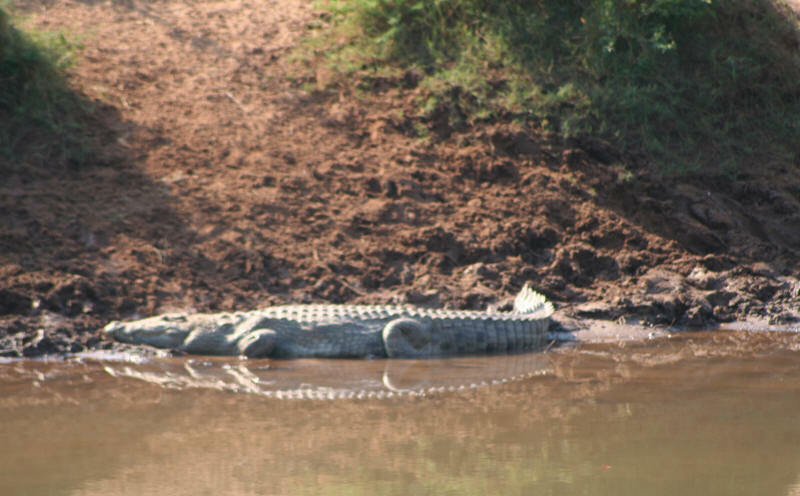 This image shows why this part of the river is so popular with crocodiles. Note how steep the bank is leading down to the river's edge. This means that water close to the edge is quite deep. This allows crocodiles to approach any prey drinking there almost completely undetected. The water as in almost all Kruger rivers is almost opaque. You can easily see how frequently the trail is used by animals coming to drink. Take a look at the map above at waypoint 43 and you can see that you can get very close to the river to watch. 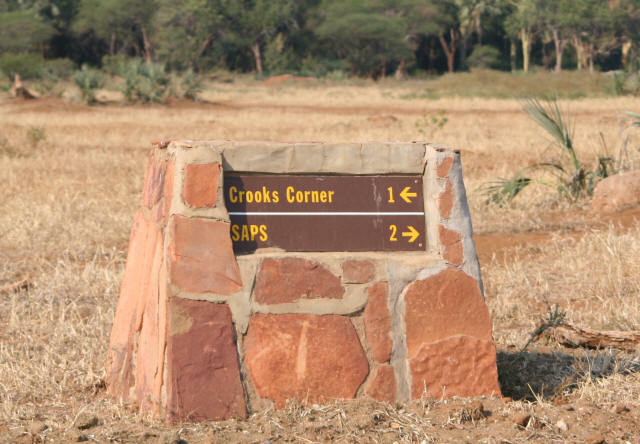 Waypoint 044 ... Crooks Corner marks the spot where the Luvuvhu river meets the Limpopo which is one of Africa's mighty rivers. This is a magnificent view site where I saw many crocodiles, and got close to numerous hippo bathing in the Luvuvhu at the confluence. I saw Kudu, warthog, water birds galore and heard the haunting cries of the magnificent fish eagles which unfortunately were out of my direct sight. Waypoint 045 ... Appropriately the drive to the South Africa Police Services (SAPS) is not far from Crooks Corner. The naming is the result of the fact that this area marks the border between South Africa, Mozambique and Zimbabwe and as such was a favourite spot for illegal hunters and smugglers to enter and leave the countries involved. The SAPS spot is an actual border crossing (legal) into Mozambique. This is almost certainly destined to become a much busier police spot in future as the Peace Parks program rolls out. Waypoint 045 to 046 ... After the intriguing and mysterious beauty and variety of the Pafuri and Luvuvhu drive the drive back to the main road was quite a let down. Maybe as a sign of times to come the tar road here was new and very wide ... the Peace Parks project will increase traffic loads in this remote corner of unspoiled Africa. 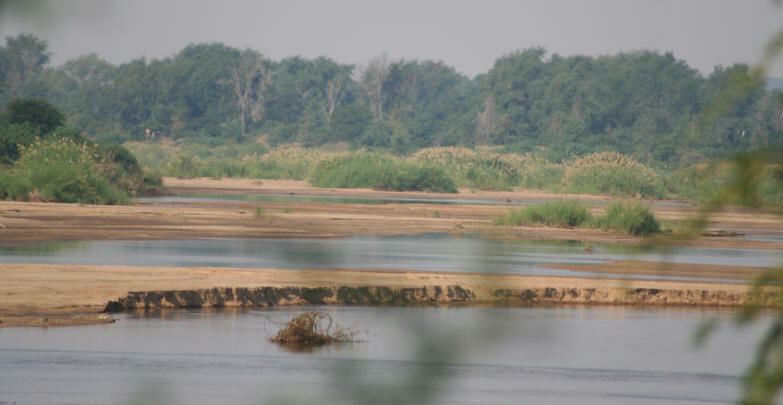 The image shows a view from Crooks Corner of the Limpopo River downstream from the Luvuvhu confluence.